Fig. 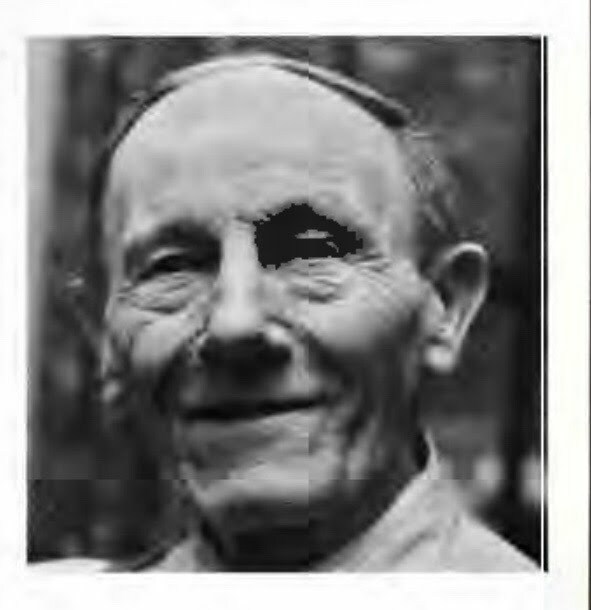 1 Alvin J. Fink at age 84 in 1959. Photo in The Alumnus, September, 1959, page 19. Alvin John Fink (1875-1965), was born in Ohio on August 9, 1875 the son of John Finke (1850-1916), a bookkeeper from Oldenburg, Germany and Catherine "Caroline" Nipgen Finke (1850-1931) from Baden, Germany. He had two sisters : Helen "Nellie" (1876-1961) and Bessie (1879-1900). According to the 1880 U. S. Census the family surname was Finke. Apparently he changed the spelling of his name to Fink randomly as in 1909 in The Numismatist since he is listed as Finke in the 1910 City Directory, when he worked as a letter carrier, and even later on in 1931 and 1932 listed as Finke. He lived at various addresses including : from 1912- 1914, 116 South Ludlow Street, Dayton, Ohio; in 1915, 110 South Ludlow Street, Dayton, Ohio; from 1916 - 1918, his mother's residence 604 South Jefferson Street, Dayton, Ohio, where he ran the Curio Store; from 1919 - 1923, 203 South Ludlow Street, Dayton, Ohio; from 1924 - 1925, he ran his Jewelry Store 300 East 5th Street, Dayton, Ohio; from 1926 - 1929, 306 East 5th Street, Dayton, Ohio; 905 Traction Building, Dayton, Ohio; 266 South 11th Street, Dayton, Ohio. He was a college graduate from St. Mary's Institute (now the University of Dayton), class of 1891, at the age of fifteen. Later he attended Georgetown University where he played baseball and was an outstanding pitcher. In 1892, he received an award in Grammar. In 1893 and in 1896, he performed a German musical recital. In 1894, he was awarded the Hoffman Mathematics Medal at Georgetown. It was at New York University Graduate School when he began collecting coins circa 1899 at the age of twenty-three. According to his Draft Registration Card in 1918 he was tall, slender with blue eyes and light hair, and worked as a merchant. He was a vegetarian. He was married (so it seems from The Curio Collector in 1911). At least one of his coin ads in The Numismatistcharacterized him as Dr. Alvin J. Fink. He sold coins, paper money, stamps, minerals, Indian relics, gemstones, jewelry, fireworks, and curios, publishing a monthly offerings list to his clientele on his mailing list. He occasionally sold direct through a store or at a kiosk or both. He is known to have conducted seven mail bid auctions beginning September 3, 1909 to March 15, 1954, all listed in Martin Gengerke, with two of them published in periodicals. Although he got bitten by the coin bug in 1899 his name first appears in the December issue of The Numismatist in 1905. In 1902 he worked as a glass cutter. In September 1909 he ran two coin auctions. The first was 4 pages with 528 lots. The second ran in the September/October issue of The Numismatist on page 294 comprising 59 lots of Colonials and Gold, Patterns, Cents, Half Cents, Broken Banknotes, Confederate Money. In 1910, working as a mail carrier he also ran an ad for a $5 reward paid to return his checks and paper money he lost while in Philadelphia, Pennsylvania. He published Catalogue and Price List, on March 21, 1910, offering Private Gold, U. S. Gold, Coins & Patterns, Colonials, Fractional Currency, Medals, and Foreign Coins. Also, in 1910 he received a shipment of two freight boxes of Indian relics from a man in Los Angeles, California. The freight bill was $15, which Fink paid. About a year later Fink received another bill for the same shipment stating there was a tariff fee error and that the bill he paid should have been for $30, not $15. Fink refused to pay the additional amount and was sued for it by the Pittsburgh, Cincinnati, Chicago and St. Louis Railway Co, The case went back and forth through the courts for years and became a test case in law in which the receiver must pay the charges. In 1911 he called his business Fink's Curio Store, Dayton, Ohio and he conducted three coin and curio auction sales. Fig. 2. 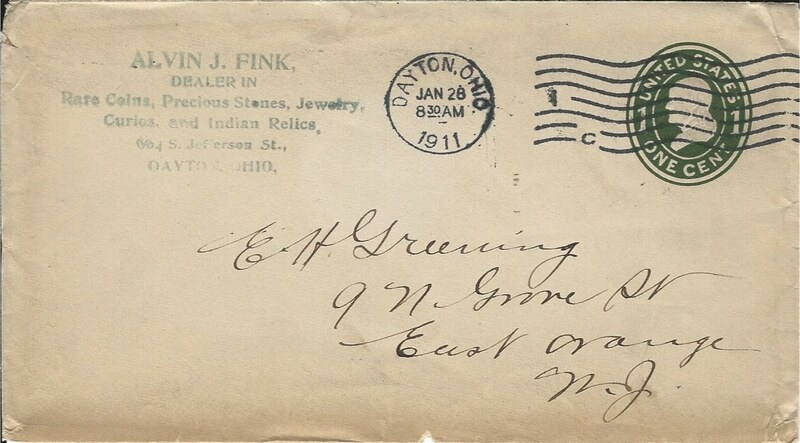 Fink's mailer to his customer Edward H. Greening (d. 1941), East Orange, New Jersey, postmarked January 28, 1911, 8:30 A.M., Dayton, Ohio. Operating as a cottage industry Fink was very thrifty purchasing inexpensive postal stationery and using a rubber stamp for his self addressed envelopes. His customer Ed Greening was the youngest brother of the famous cartoonist Harry Cornell Greening, the creator of "Prince Red Feather," "Percy," "Joco and Jack," "Uncle George Washington Bings," "Majah Moovie," "The Wishbone Man," and "Prince Errant". Courtesy the Lupia Numismatic Library, Fink file. In the May 1912 issue of Fink's Offerings he had listed an 1804 Silver Dollar for sale in VF condition for $2,600.00. The known 1804 Silver Dollars in VF condition are that of the Class I “Cohen Specimen” ex William B. Wetmore sold by S. H. & H. Chapman in June 1906; and the Class III Rosenthal Specimen. Fig. 3. Fink's May Offerings (1912). Note item no. 1 is an 1804 Silver Dollar in VF condition for sale at the discounted price of $2,600.00. Since James H. Manning purchased the Cohen Specimen from the Chapman Brothers' Wetmore sale in June 1906, and James Ellsworth owned the Rosenthal Specimen from 1894 until 1923, which 1804 dollar is this? Keep in mind he eventually is arrested and imprisoned for mail fraud twenty years later in 1931 and 1932. Courtesy the Lupia Numismatic Library, Fink file. In 1913 he was indicted on charges of sending improper postcards containing obscenities through the mail, but was not prosecuted. Fig, 4. 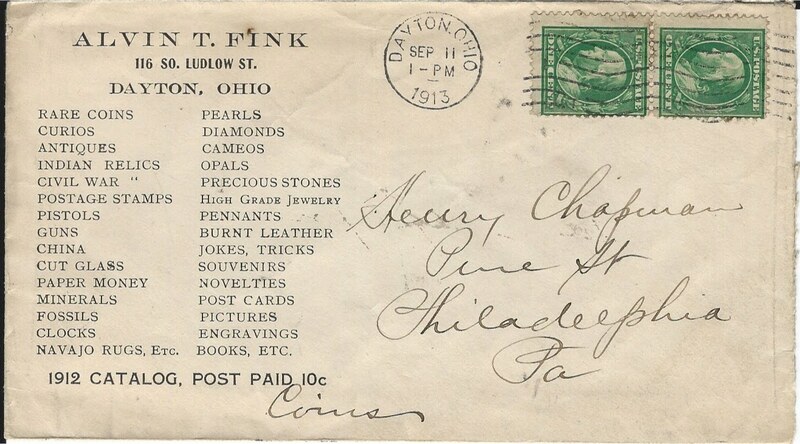 Fink sent this letter to Henry Chapman, Jr., postmarked September 11, 1913, 1 P. M., Dayton, Ohio. He must havegotten a good discount on his business envelopes and letterhead since the printer erred giving him the middle initial "T" instead of "J". Courtesy the Lupia Numismatic Library, Special Collection, the Chapman Family Archive. In 1919, he owned Fink's Jewelry Store, 203 S. Ludlow Street, Dayton, Ohio, where he sold in addition to jewelry, gems and the like, coins, and curiosities. Fig. 5. Fink sent this letter to Henry Chapman, Jr., postmarked March 25, 1919, 2 P. M., Dayton, Ohio. Booklet pane of three (Scott No. 498, green) with the 3 cent mailing rate set November 2, 1917 as the War emergency postage rate, reduced and restored to the 2 cent rate July 1, 1919, three months (97 days) after this letter was sent. Also, note the postman's penciled address correction to 335 South 16th Street. Henry moved there in December 1916 staying there until his death January 4th, 1935. Apparently Fink never updated his file. Courtesy the Lupia Numismatic Library, Special Collection, the Chapman Family Archive. In the 1920 U. S. Census he is listed as single and the owner of a curio shop, which he called Fink's Curio Shop, Dayton, Ohio. 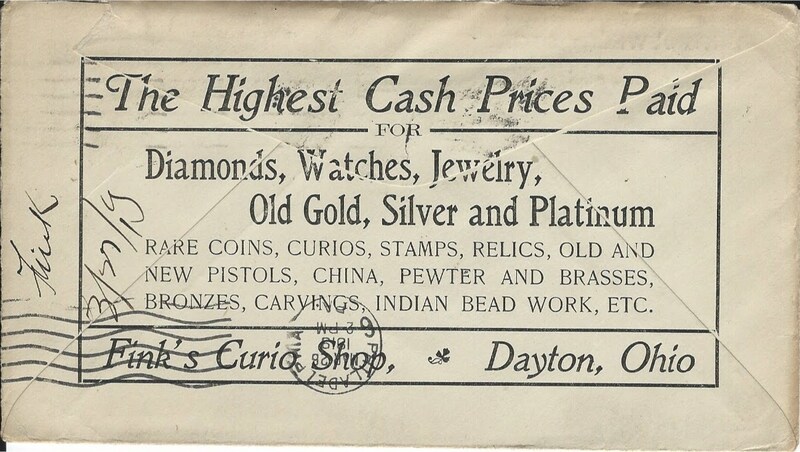 However, his business envelopes for Fink's Jewelry Store were printed on the reverse side an entire advertisement for Fink's Curio Shop, in 1919. Fig. 6. Verso of Fink's letter to Henry Chapman, Jr., postmarked March 25, 1919, 2 P. M., Dayton, Ohio. 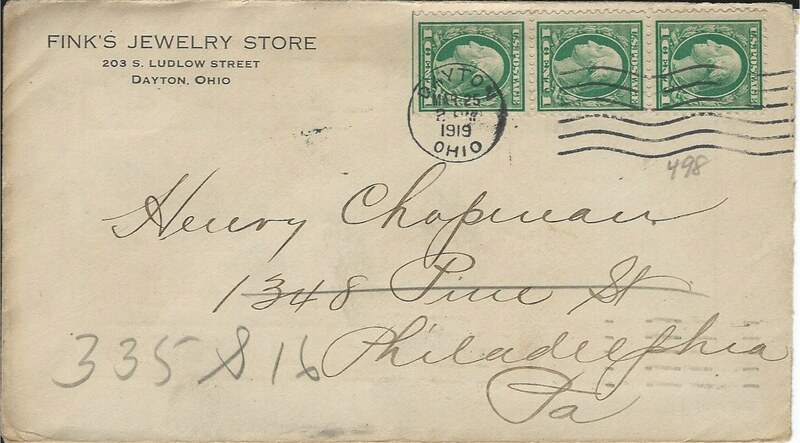 Note the very scarce Philadelphia Universal Machine Cancel as a backstamp, postmarked March 26, 2 P.M,1919. (Clarke No. 301a). Courtesy the Lupia Numismatic Library, Special Collection, the Chapman Family Archive. From 1931 - 1933, he ran the Finke Fireworks Company, rear 314 East 5th Street, Dayton, Ohio. On September 22, 1931 he was arrested by a Federal Marshall for mail fraud, i.e., obtaining money in the mail advertising firearms for sale which he did not possess. In January 1932 he was sentenced to six months imprisonment in the Miami County Jail. Circa 1937 or 1938 Harry X. Boosel saw the 1873-S Standard Dollar offered by Fink from one of his mail offerings. Fig. 7. 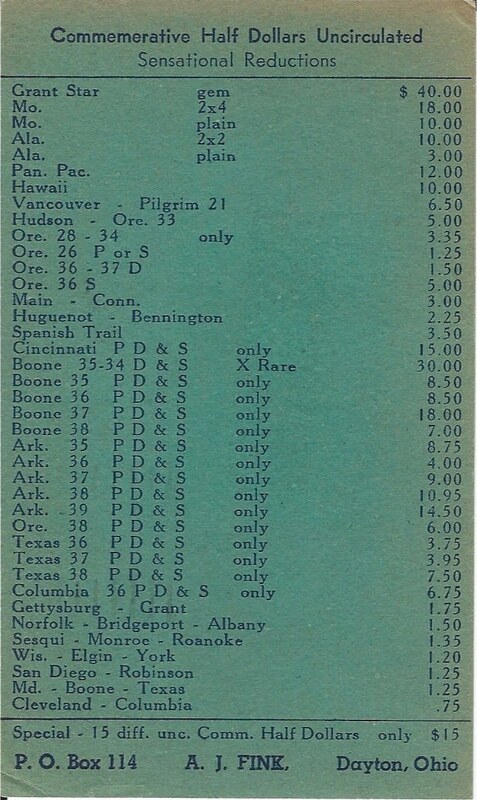 Postal Card advertisement listing Uncirculated Commemorative Half Dollars dated June 1939. Courtesy the Lupia Numismatic Library, Fink file. Fig. 8. 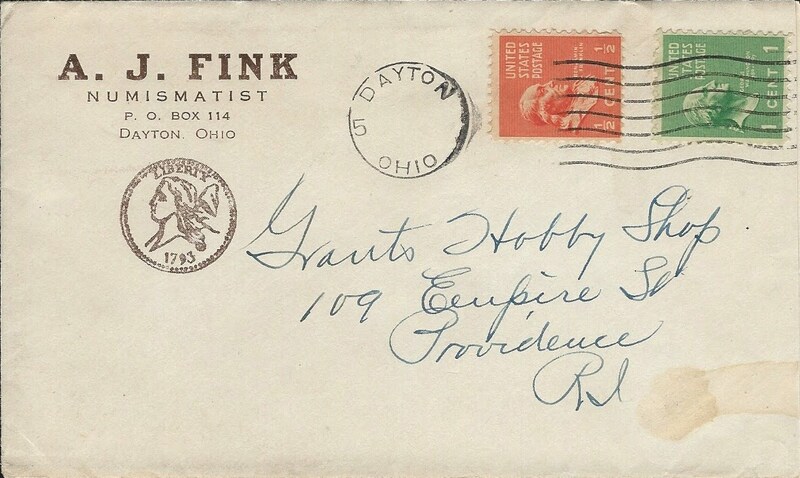 Fink's mailer sent to the famous coin dealer Horace M. Grant (1873-1960), circa 1938/9. Note he franked this envelope with two Prexies, the 1/2 cent Franklin (Scott No. 803 A275 deep orange), and the 1 cent Washington (Scott 804 A276 green), reflecting his bulk mailing rate discount with the Post Office. These stamps were issued April 25, 1938. Consequently the letter was mailed sometime thereafter. Grant's previous address in the 1920's was 93 Empire Street. Courtesy the Lupia Numismatic Library, Fink file. In the 1940 U. S. Census he is listed as single and a numismatist on Jefferson Street, Dayton, Ohio. In June 1940 he advertised in various Ohio newspapers, News-Journal, The Times Recorder, The Marion Star, and The Evening Review, looking for boys and young men to distribute cards and take orders. He joined the ANA in 1948 and was given member number 15480. However, his name neither appears in the ANA Membership Directory published in December 1948 nor in any other subsequently. During the 1950’s he operated his coin business in the lobby of the Dayton YMCA where he was a member and a daily swimmer. At that time he published Fink's Coin Bulletin. During that time Henry Norweb was a frequent correspondent ordering various coins on approval but most were returned (See Appendix 2 in Michael J. Hodder and Q. David Bowers, The Norweb Collection : An American Legacy (1987). Specimens of his coins are found in the Harry George Collection. Other notable coins include : Ira and Larry Goldberg, Lot 209, February 1, 2009, 1828 Matron Head Large Cent (N-5), provenance ex Fink; Stack's Bowers, New York Americana Sale, January 2013, Lot 13040, 1828 Matron Head Large Cent (N-5), provenance ex Fink; Ira and Larry Goldberg Sale 51, lot 187, 1827 Large Cent (N-1), and lot 392, 1837 Young Head Large Cent (N-13). On March 15, 1954 he published his smallest auction of 98 lots in The Philatelic Press. He was robbed of an estimated $40,000 to $50,000 in rare coins in 1961 by Manuel Alzfan, 42, George James Malogorski, 30, and Geraland Lee Hoffman, 19, all of Dayton, Ohio. Malogorski and Hoffman pretended to be telegram messengers gaining access to his apartment where he was a boarder in a rooming house. Hoffman hit the 86 year old Fink over the head with an improvised blackjack cutting him. When Fink was found by the rooming house owner Mrs. Francis Layne he was rushed to the hospital. The gang stuffed rare coins into five shopping bags. The Daily Reporter story reads : "A. J. Fink, 86, partially-crippled coin collector, was found yesterday [November 7th] in his room a half block from police station, tied to a table leg by a cord around his neck. The intruder made off with $20,000 to $30,000 in coins, many of them gold pieces." He died nearly four years later to the day on November 8, 1965, and is buried at Calvary Cemetery, Kettering, Ohio. September/October 1909, The Numismatist, page 294, 59 lots of Colonials and Gold, Patterns, Cents, Half Cents, Broken Banknotes, Confederate Money. September 3, 1909, 528 lots, 4 pages. The Curio Collector, Vol. 1, No. 4, Winter (1911) : 17 cites Mrs. A. J. Fink of Dayton, Ohio vouching for a new member #395 E. E. Harris.